Everyone needs friends. As adults our friends help to celebrate birthdays and support us when we have a bad day at work. As children, friends and relationships with peers are monumentally important for the development of self-identity, confidence, emotional intelligence, social skills, sharing skills,etc. But what about babies? Do babies need friends? Turns out they do! A great article in Early Childhood Research & Practice talks about the importance of relationship building in infancy and toddler years. This particular article provides descriptive analyses of one laboratory child care setting in which infants and toddlers were in open classroom settings and allowed to interact with each other. While this doesn’t statistically test the importance of friendships in early infancy years, it does provide evidence for the success of peer-to-peer interaction even during very early years. The authors of this study observed a childcare setting of children focusing primarily on the children in the infant and toddler classrooms. The researchers changed the classroom environments so that the children in the infant and toddler classrooms were in one large room that was separated by transparent barriers so that infants and toddlers could interact. They also encouraged teachers to help the infants and toddlers interact by bringing non-mobile infants into the toddler classroom for lunch and other activities. Environment: Creating a space where infants and toddlers could see and interact with each other as well as time in which they were all together was crucial for interaction and relationship development. Toys: Toddlers were particularly interested in interacting and playing with the infant toys, so infant toys and and play space was shared with toddlers. Also adding additional dolls to the toddler playroom allowed toddlers to practice caregiving behaviors that they saw the teachers exhibit toward the infants. Modeling: Toddlers wanted to be involved in the care-taking of the younger children. Toddlers would watch as an adult changed a baby’s diaper or help to read a story to a younger child. Joint Experiences: Toddlers and infants were provided with activities that they could do together, like finger painting or sand play. These activities allowed the toddlers and infants to interact and play together at an appropriate developmental level for each child. Spontaneous Interactions: Toddlers and infants benefited from these interactions. Over time the infants began to model behaviors they saw demonstrated by the toddlers, like washing their hands before lunch. Toddlers adapted their interactions to the appropriate developmental level of the infants and would bring and share toys with the younger children without being prompted. Infants and toddlers enjoy friendships and forming relationships. Even though infants and toddlers are still learning how to control their bodies and emotions, being around other children, even children of different ages can be beneficial for social emotional development and relationship building. Future research should continue to examine the specifics of infant and toddler friendships and the ways in which they may positively influence development. McGaha, C. G., Cummings, R., Lippard, B., & Dallas, K. (2011). Relationship building: Infants, toddlers, and 2-year-olds. Early Childhood Research & Practice, 13, 1. There is a lot of popular press about the importance of kids reading throughout the summer in order to continue to improve their literacy skills. There is a also LOT of evidence supporting the importance of these statements. Kids really do need to maintain their literacy skills and continue to develop them during the summer and often times children who do not read during the summer come back to school in the fall having lost the skills they had worked on the previous year. But it’s not just literacy skills that have the potential to decline during the summer. Having 2 months off school (or more) has an impact on all subjects and when schools are out parents do need to take steps to make sure their children are still learning outside of the classroom. The good news is there are a whole bunch of ways to work with your children on math, science, geography, current events, and other subjects that they are not formally studying during the summer. Here are just a few ideas, but get creative, opportunities for fun learning are all around you during the summer! Check out Sesame Street’s Math is Everywhere site. The site provides math related videos including my favorites with John John counting with Henry, videos of Sesame Street clips related to shapes, patterns, addition & subtraction, and printable activities that you can do with your child. Of course my favorite part is the Parent’s Guide that provides great tips, games, and activities to do with your child at home that are math related! For slightly older kids, Cyberchase is a great math TV show and their website has all sorts of information for parents, games and activities for kids, and list of resources for how to use math at home in everyday ways. The Cyberchase website also offers suggestions for science tips and resources to help children pick out science projects. Cybercase also offers the Summer Challenge which combines tv episodes of Cyberchase with related activities. If your child enjoys playing games on your smartphone of table computer, MotionMath is one of my favorite apps out there! MotionMath provides users with the opportunity to connect physical movement (moving the device around) with learning math (fractions, etc). 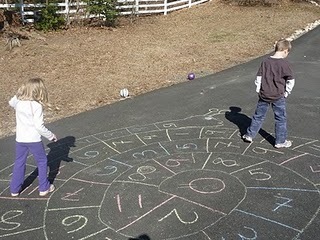 It is a very creative and fun way to practice math skills! Geography: Have a trip planned? Pull out a map (or print one) and have your child highlight the route he thinks you should take to get there (if you are driving this can be roads, if you are flying have them draw how the plane should go). Ask questions about what stats and cities you will pass through, will you see any rivers, lakes, mountains? What direction will you be traveling to get there? What about to get home? This activity can be used for even short trips to the pool or to the park. Math: Math is around us constantly! Have your child add up the cost of her favorite groceries at the supermarket, count how many mosquito bites you get, how many steps it is to the pool. Remember that math is more than just numbers. Talk about the shapes you see in the summer- circle wheels on your bike, triangle seats, cylinder handlebars. In the car, play -spy with shapes, first everyone has to find something that is a square and take turns guessing until you figure out each person’s item. At the beach or at the park, do math problems in the sand and have your child use a stick to fill in the correct number. Art & Music: Take advantage of the warm weather and the easy clean up, let your children do art projects outside: chalk is always fun in the summer, but finger painting can be awesome outside too, let your child add in some of his natural world into his art with leaves, dirt, grass, etc. Summer is also a time where many communities have free music festivals. Take your children to hear some live music, encourage them to dance, and make their own songs. Physical Education/Movement: With very young children learning to move and control their movements is a very important part of development, but even for older children physical exercise is extremely important and lots of fun. Summer can get hot, but take advantage of local pools for swimming; get out early in the morning and take a bike ride with your kids or just a walk, the parks a great place to run and play but with more daylight in the summer get creative and try out new parks- your kids will love the new climbing structures and challenges and novel parks! Most importantly make sure learning is fun for your children! It takes time to think of fun activities but make a list of things as you think of them so that you always have fun learning opportunities for your kids this summer! And talk/email ideas to other parents or start a summer learning activities email exchange- pass along great ideas and ask for some back from your friends! I spent last weekend- yes Memorial Day weekend- at the International Communications Association (ICA) Conference in Boston, MA. This is a very large conference of Communication Researchers, but we now have our own Children and Adolescent Media Division at ICA! Therefore there area always really great, relevant studies presented here. Also this year there was a wonderful Pre-Conference that was organized by Michael Rich and Dafna Lemish to discuss Children and Media in a smaller group. The pre-conference addressed multiple issues including: communication between media researchers and producers, communication between media researchers across different disciplines, and communication to parents and the news media to make sure that the important research that we all do gets to the public in an appropriate and understandable way. PlayLearnParent received a wonderful shout-out by Alison Bryant, President and Founder of PlayScience, as one way to communicate with Parents. PlayScience offers a wonderful blog that is a fabulous place for Parents to get more information about all things media. See their most recent post about “Pink Toys“. PlayScience also offers a Facebook page where you can see additional updates on media related research, new stories, etc. Another wonderful resource for parents is Ask the Mediatrician which is a website (and is also on Facebook) where parents can write in and ask Pediatrician/Mediatrician Dr. Michael Rich-the Director of the Center on Media and Child Health at Children’s Hospital Boston, Harvard Medical School and Harvard School of Public Health- their questions related to children and media. The Joan Ganz Cooney Center has a wonderful website, a terrific blog, and a wonderful resource on their Research and Initiatives. The Joan Ganz Cooney Center is an independent research and innovation lab that was created in the legacy of Joan Ganz Cooney and her dedication to children’s media which led to the creation of Sesame Street. Sesame Workshop offers wonderful resources for parents! One of their initiatives is the Learning is Everywhere which provides parents with ways to include learning opportunities in their everyday life. This initiative offers videos clips, activities, and tips for parents to follow (in both english and spanish) to provide parents with resources to help their children prepare for school. Sesame Street also offers a Parents page on their website that has wonderful resources for parents. This site offers videos, games, activity suggestions for children as well as parenting tips! 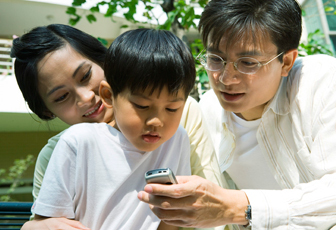 With technology, the ability to reach and provide resources for parents internationally has grown but with so much “out there” sometimes it’s hard to know where to look. I hope this post provided some help for parents for places to begin looking for answers!